Come to Otford, a jewel nestling in the heart of the beautiful Darent Valley. Come to Otford and see the only listed duckpond in the country, come and see the World’s largest scale model – the Otford Solar System – with branches at Los Angeles, Sydney and we hope soon, when NASA goes there again, the Moon! We have informative and imaginatively presented displays in the Heritage Centre and a Tudor tower and gatehouse which are the remains of a once awe-inspiring palace which was bigger than Hampton Court. Come and see the magnificent Millennium mosaic designed by the renowned mosaicist Oliver Budd which shows life in Otford from prehistoric times to 1999 and the Sir Edwin Lutyens-designed Church Hall. Come and visit the Otford Heritage trail with its informative displays of what life was like here in previous times… and for the children, a mouse-hunt to uncover. Come to Otford to visit a wide range of shops; including a bespoke milliner, signature fashion jewellers, a florist, an art gallery and a selection of excellent cafés, restaurants, pubs and tea rooms. Come to Otford and use it as a starting point for spectacular walks in an area of outstanding natural beauty. We have exhilarating hilltop views and tranquil river-side walks, we have bluebell woods in spring, and breath-taking autumnal colour. Otford is at the junction of the Darent Valley and Holmesdale between the North Downs scarp and southerly Sevenoaks Ridge in an area of outstanding natural beauty. It is well served by rail, being on the London Victoria to Ashford line, the London Bridge to Sevenoaks line. The local bus service along the Darent Valley is operated by go-coach. Anglo-Saxon Ottanford (Otta’s ford, after the local chieftan) is the site of battles with Offa and Canute; its ancient past pervades buildings and architecture recognised in the designation of the Village centre as a conservation area. 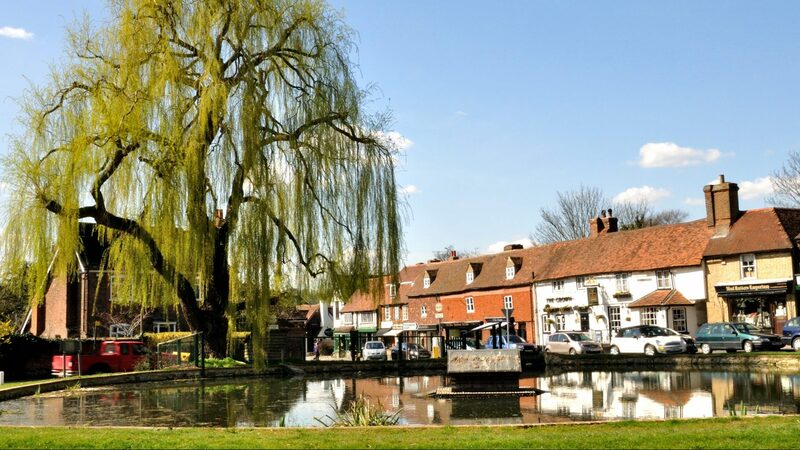 Otford itself is a Heritage Village dating back to Roman times with many listed buildings, including the only duckpond in the country with listed status! The pond, which is a Grade 2 listed structure, first listed 16 Jan 1975, is thought to date back to Anglo Saxon times, when it was probably used as a drinking hole for local livestock. In 2014 it gained the distinction of being the Roundabout of the Year. Guided walks around the Village of Otford and the Archbishops’ Palace are available for groups by arrangement. These walks led by local historians Cliff and Elizabeth Ward, can last between one and two hours depending on the interests of the group and the time available. For more information call 01959 522 384.